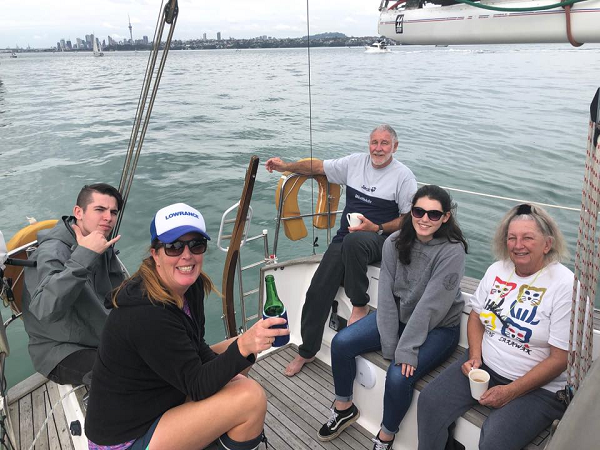 In the theme of closing day being a bit of fun we had the whole family on board Cloud 10. Motoring out of the marina I got a fright seeing how low we were in the water, 6 people really makes a difference! We got down to the start line to a postponement which was expected due to how light it was. We discovered that birds had been nesting in our stack pack as the mess they left was all over the main when we hoisted it. My Mum decided to put the kettle on and bring out the biscuits while we waited to start, there was a lot of talking eating and not much concentration going on so when we did start it wasn’t that flash and we were pretty late. The clues were great and we figured out our first mark pretty quickly. Blue Beat and Near and Farr had started well and were already in front, Eye Spy was even later than us to the start so we had the jump on them at the first and second mark but they were slowly catching us. Things went wrong when we got to meola, I hadn’t gone down far enough thinking the little breeze and 3 knots we were doing would get us around. The wind disappeared and we started going sideways with the tide, drifting past a fishing boat rather closely. By this stage Eye Spy had caught us with their spinnaker up and were trying to pass, the wind left them too and they started drifting and ended up in the same predicament as us. We slid past the mark without rounding it and started going down the harbour sideways with the tide. The family tolerated this for 5 seconds and then decided they were bored. There wasn’t much hope we would get back to the mark so the engine went on and the sails came down. We then went over to a lovely little bay anchored and had lunch whilst watching the others trying to race still. Eye Spy decided to give up not long after us and stared their trek home, very slowly. Despite our DNF it was a lovely day out and the burgers back at the club were excellent. Thank you Lisa and committee for organising it all. Preparation for the closing day race. Duncan "Mike will you crew for us?" Mike "are there going to be brownies???!!!!!!" Duncan "samantha you had better get baking!!" Me "Duncan I will make brownies if you make your bacon and egg pie?" we kidnapped Joe from Grandpa on the way down the dock .... grandpa did not seem to mind. So we had Big mike , Joe, Duncan and I for the closing day race. We were aware of the fact that Lisa had come up with cryptic clues which we had to decipher in order to work out the course. I had asked if we could get extra time due to being dyslexic however Lisa thought our warped minds would able to figure out the clues. Only four boats rocked up for the closing day race... Eye Spy (minus Trevor as he could not race as he knew the answers to the clues), Blue Beat, Cloud ten and us. There was very little wind, a big tide, but it was a glorious day and what better to way to spend a saturday. We positioned ourselves close to the start line, which paid off and we got line honours - well done Duncan!! We were in the lead but only running white sails and Blue beat and eye spy were running their spinnakers. It was a tricky race with huge tides and not much wind. Due to one of the clues our poor crew had to endure me wailing the words to the sound of music.... Mike is used to my singing but Joe's poor ears were probably burning... "Do a deer a female deer...re - a drop of golden sun......". I suppose it was an improvement on my other song "allllll by ourselveessssss". We heard the call that Eye Spy had retired and so had Cloud ten... hmmm now only two of us. hmmmmm.. hey ho hopefully there will be more wind soon. The lead between us and blue beat kept changing... they were on the hunt for a trophy and so were we! It was all good going with the tide, however getting around the mark to head home was rather tricky.... blue beat had not rounded the mark.... and were going backwards... we manged to get around the mark and edge forward..... quite a while (at least one carlsberg) later Blue beat finally got around the mark. Not long after this Mark from Eye spy radioed to say that there was no wind by taikarta! Hmmmm so not wind and a huge tide... neither boat was going to get back to the club midnight at the rate we were moving. And we did not have enough pie or brownies to stay out for that long. Duncan and Gary had a shout across the water to each other... and made a gentlemen's agreement that it was a DRAW after taking into consideration both handicaps. All crews looked rather relieved and both boats turned their engines on, dropped their sails and cracked beers open. On our way back to the marina, we came across Eye Spy.... they were slowly motoring back to the club against the tide....luckily our engine has a few more horses than theirs! Back at the club all of the skippers were called to a briefing with Lisa (who is a qualified sailing judge). 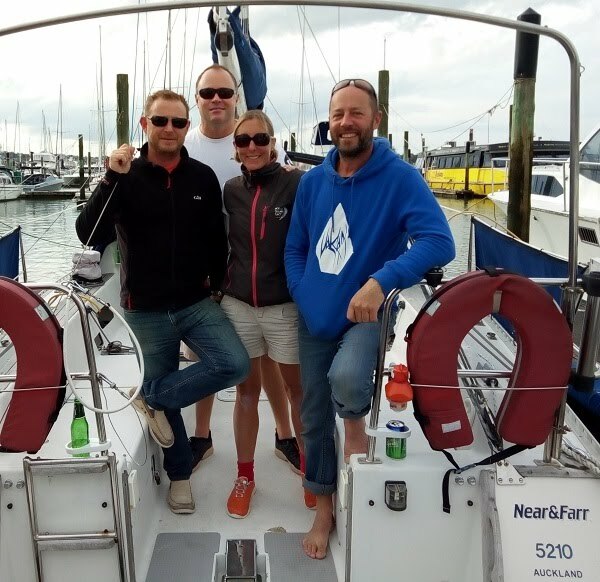 It was agreed by all that Closing day racing was won jointly by Blue Beat & Near & Farr. Lisa had put on quite a spread at the club - build your own gourmet burgers for $6... they were good... really really good!!!!! Once again a great day on the water. Thank you to our crew of Mike and Joe. And to Nigel for manning the start and Lisa for her judge skills and catering skills.